Balm – a word comes to mind as soon as anyone has muscular pain. It is a medicine which is available in every household. Balm is a medicine which can be applied on all kind of muscular pain and gives relief almost instantly. Pain can be because of any physical exercise, sport or change in weather condition, Balm works equally effectively on all kinds of pains. Balm helps for elderly people who has tired muscles and to athletes who apply this before and after their sports activity. It helps quickly soothe any discomfort in joints or muscles. In ayurvedic terms balm helps in balancing Vata & Pitta dosha. Balm has many ingredients which gives warmth, reflexes muscles and helps in curing pain in the affected area. Common ayurvedic ingredients which are used in balm are natural wax, essential oils and few other herbs which help in reducing the pain. Balm can be used by person of any age; it is equally effective for children as it is for any young or old person. The best part of ayurvedic products is that they don’t have any side effect and works very efficiently. Eazol balm is made from pure extract of Pudina and wintergreen oil and unlike most of the other balms its smell is also calming. Eazol is a brand which is manufacturing world class ayurvedic medicines which are being used by thousands of customer every month. 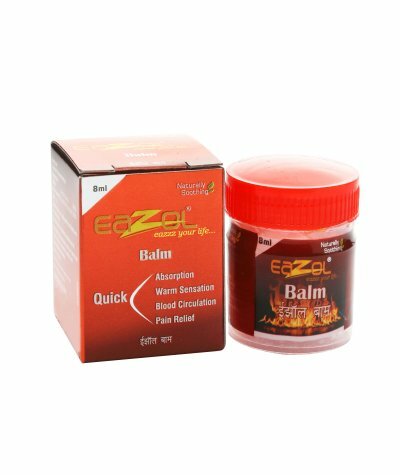 Eazol balm is available on https://ayurvedmegastore.com. Eazol balm is a gift of Ayurveda to all human kind. Ayurvedamegastore is India’s biggest online portal having more than 100 ayurvedic brands and over 6000 products. All products available on Ayurveda megastore are being sold at discounted prices.